If you would like to make a donation in Memory of a loved one that was a WWII veteran, other veteran, friend or family, you can go to the Donations tab and write the message for who the donation is for in the Message area. Thank you so much for the support of these wonderful veterans! In honor of Robert Michael Gagliano, Vietnam Veteran serving with the 7th Calvary Division. Donation made by Donald and Rita Gagliano. 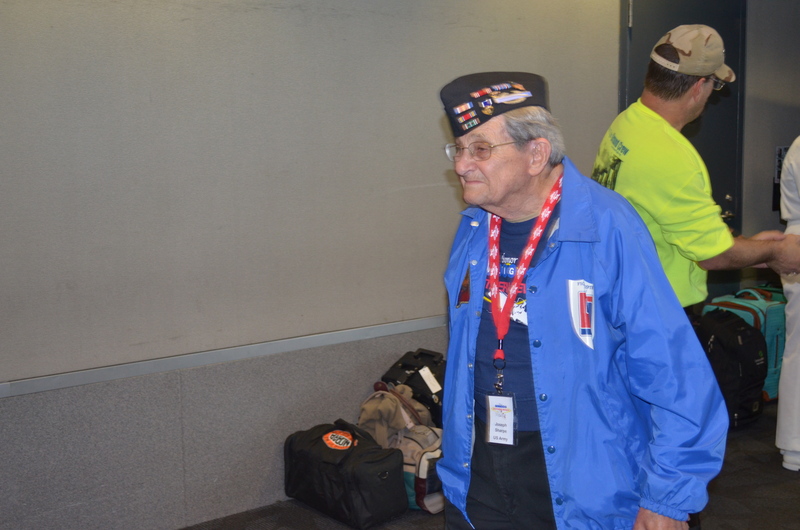 In Memory of Joseph Sharpe, a WWII veteran that went on our flight in 2014. Donation made in memory by Robert Reed. In Memory of Art Lovelace, a WWII and Korean War veteran. Art went on our flight in 2015. From his daughter, who went as his Guardian, “The trip did something to him; it brought him some closure, some peace, and some pride as well as helping him accept that he was worthy of the honor”. In Memory of Mr. Arthur Lovelace from Capt. and Mrs. Ernest Bizzozero. In Memory of Mr. Arthur Lovelace from Elizabeth and Drennon Yarborough. In Memory of Charles Nastasi, a WWII Army veteran that went on our October 2018 flight. Donation made in his honor and memory by Janet Woerfel, Fontanne Myers and Susan Clarke. In Memory of Mr. Nastasi from Vicki Caiati. In loving Memory of John Hayes WWII and Korean War Veteran, Flew 100 missions piloting an F84 during the Korean War. Loving donation was made by his sonDavid Hayes. In Memory of Peter Farlick. “Thank you for serving in Vietnam and for being an unwavering patriot” from Dorthy Gandee. In Memory of 3 WWII family members. Mr. Robert Mann, Mr. Arthur D Mann and Mr. Lester Mann. by RS DeBerardinis. In Honor and Memory of Mr. Marcel C Four Jr. Private First Class 82nd Airborne, who served in Normandy Invasion June 6, 1944, the fight for the Nijemgen Bridge, Holland and the Battle of the Bulge. Donation made by daughter and loving family, Mrs. & Mr. Fanizzi. 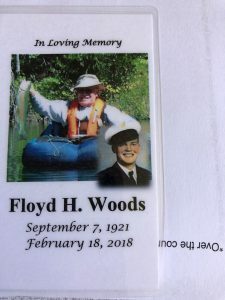 In Memory of Floyd Homer Woods who went on our April 2014 flight. 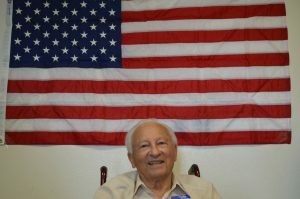 He served in the US navy during WWII. From Darrell and Maureen Ostyn. “Uncle Floyd, you were worth it and made a difference”. From Mr. Philip Dupree “A special gift in memory of Mr. Floyd Homer Woods from the Varex SIPNPI Engineering Team and Executive Assistant. In loving Memory of Edna Filson, who passed quietly away just before her 95 birthday. Mrs. Filson was one of the first women to go on our very fist HF. She was a nurse during WWII. Mrs. Filson celebrated a life with three wonderful daughters and many grand children. She always had the greatest smile on her face. Ms. Dianne Downing made a donation in her honor. In memory of Mr. Edwin M Lum. Sr, who passed away in May 29th, 2017. 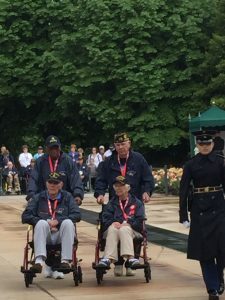 In 2014 Mr. Lum traveled to Washington, DC with HFSN and had the privileged to place a wreath at the Tomb of the Unknown Soldier. 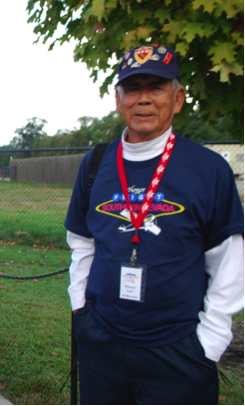 Mr. Lum was active in WWII, the Korean War and the Vietnam War, serving in the USMC, USAF and CA ANG. Ed’s family and friends will always remember him for his love of country, flying and golf. In his memory the following have made a donation to HFSN in hopes that their mission may continue to honor or nation’s veterans. Beverly Iba, Glenn and Gloria Iba, Al and Patty Iba, Marilyn and Alex Havasi, Clifford Higashi, Candace Nagasone, Glenn Nojiri and Family, Steve and Laura Uyemura, Robert and Dayna Arii & Family, Reggine Kim & Derek Kim, David and Lilyan Ujihara,Russell Yamano & Ann Masuda, Carla Fujimoto and Bobby Konno. In addition the family would like to thank Kathy Hirose and Jeff and Daisy Saito for the beautiful floral arrangements that gave such a serene setting for the service. 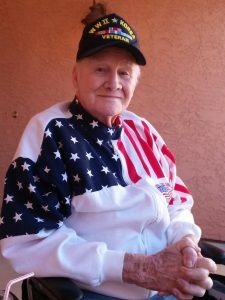 Dr. James Laidler, a veterans from our April 2017 flight has passed away. 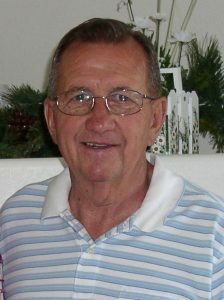 A donation in his memory was made by Monica Deeter. Mrs. Deeter heard about how much Dr. Laidler enjoyed his trip and we are thankful for her donation in his name. Mr. and Mrs. Blank made a donation in memory of Dr. James Laidler. Letting us know how much the flight meant to him. Thank you for your support of HFSN and for honoring the service of Dr. Laidler. Ms. Diane Munn made a donation in memory of Dr. James Laider. We are thankful for the donation and your desire to honor Dr. Laider. Donations made by Robert D. In Memory of his father, Robert Alvin Mann, his brothers Arthur and Lester Mann, all who served in WWII and have passed away. In memory of Jerry Morlan of Berthoud Co. Mr. Morlan was a Korean War veteran that went on the HF out of Colorado. However, his family has asked that donations be made in memory of him, to us. Mr. Morlan was in the Navy as a Fireman on the USS Kennebec, which delivered fuel to the fleets in the Pacific. Dawn Walker, one of our Board members is a good friend of the family and they wanted to honor Mr. Morlan with these donations to HF. Mr. Morlan was much loved by his family and community. In Memory of Robert Dodds. A Pearl Harbor survivor, and honorable veteran from our April 2016 flight. A wonderful person to know, with a life of honor and distinction, loved by family and friends. Mr. Dodds served in the Navy and on December 7th was on a sub tender when the attack began. 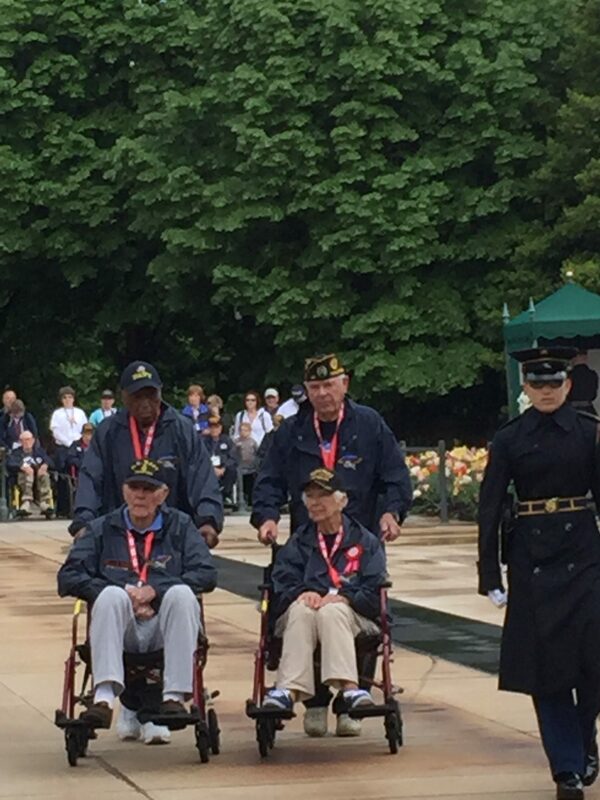 Here is Mr. Dodds at the Tomb of the Unknown Soldier after laying a wreath with three other of our veterans. He is sitting next to Irene. In Memory of Irene Miller. 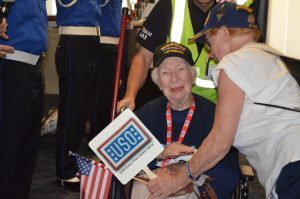 Irene turned 94 on or trip in April 2016 and was able to celebrate in style with 28 other WWII veterans. 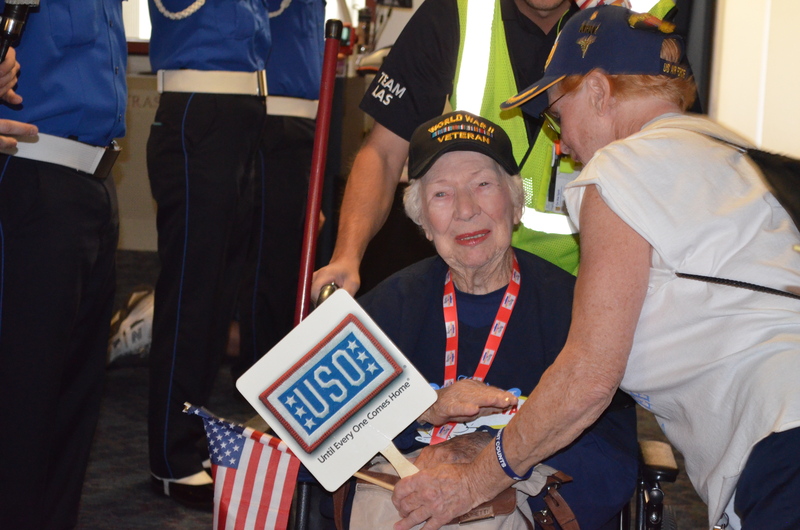 Irene loved being in the Navy and was very proud of her service to our country. In Memory of Diana Langon, donation by Market Force Information. Diana was a wonderful volunteer with HFSN. She was always at our Pancake Breakfast Fundraisers, making sure the coffee was ready right away.